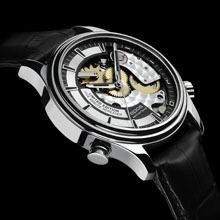 For 2009, the EPOS 3373 five-minute repeater has been given a new look. This exclusive special edition is restricted to 200 watches worldwide. The basic ETA 2892-A2 movement has been supplemented with the DD88 striker module, the whole luxuriously embellished with a pearl finish and blued steel screws. This model comes with a curved scratchproof sapphire crystal and a luxury leather strap with double pusher folding clasp. Every stainless steel case is numbered and a see-through back exposes the decorated movement. The pushbutton for the five-minute repeater is situated at eight o'clock. 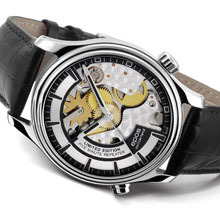 The dial is partly open, exposing the movement and the complex striker module. This watch represents pure luxury and will certainly delight every lover of fine mechanical timepieces. 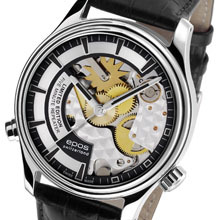 This model is a new masterpiece of watchmaking from Epos. Lovingly crafted in the best traditions of Swiss haute horlogerie, every watch is an individual masterpiece.